OK... was it really the weekend? Because it didnt feel like the weekend... at all... it all just went by in a blur. I'm actually excited for Monday to get back in a routine. ... anyways, Friday kicked off with Ricky & I taking advantage of the 2 for 1 at Starbucks this weekend. Anyone else take advantage of the deal between 2-5 on their holiday drinks? 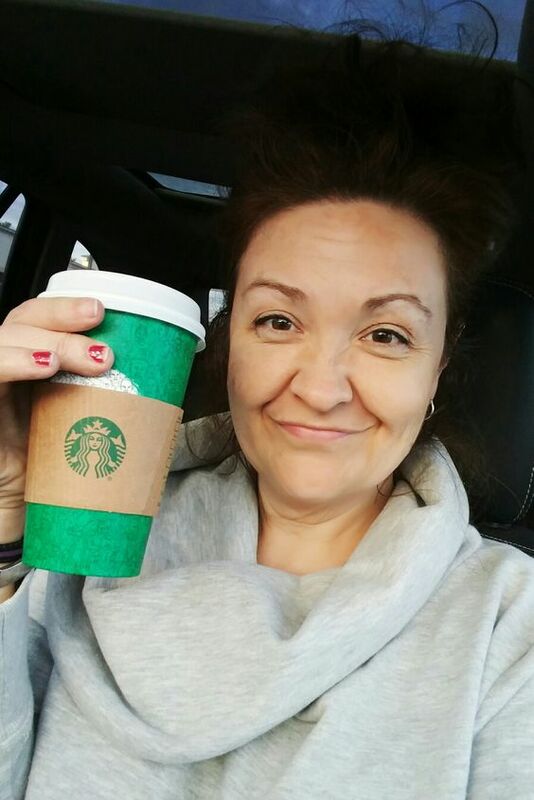 I was excited because I wanted the red cup to kick off the holiday drinks - especially because I was listening to Christmas music... yes, we have a local radio station playing 24 hours of Christmas music already. I'm not going to fight it this year. I'm giving into it. So I was excited to get my red cup, to sing O Holy Night to the top of my lungs... & then get this cup. What the heck? Green?... My Starbucks always seems a day late & a dollar short. I'm still counting it as festive. But riding with the windows down because it was in the 60's did take away from the Christmas feeling anyways. Funny side note... to get the 2 for 1 at Starbucks, you have to get a 'holiday drink' - we asked what was included with that. I ended up getting the Salted Carmel Mocha - which is what I like anyways... but Ricky likes plain mocha drinks. Not on the list. So he asked for a "Peppermint Mocha....." which is on the list... but he asked for it.... "with no peppermint" ;) haha.... the lady just looked at him with the funniest look. I told her, I'm so glad someone else is giving him that look besides me. She wasn't too happy about the little sneaky way... but we kept joking with her & at the end, she handed over his drink & said, "One Peppermint Mocha" & winked at him. Glad we warmed her over & she wasn't too mad. That Ricky. Gotta watch him. I ended up spending my whole Friday night editing pictures. I'm so excited about this wedding & all the pictures. Kept me up till past midnight. I just couldnt stop editing. I was hoping to sleep in on Saturday after a late night Friday, but no.... Bruno has other plans. Like just waking me up so he can get on my pillow & go back to sleep. Mercy. I needed to get up anyways. I had a lot on my to-do list. Fun stuff like cleaning, & working out & reading for my Bible Study group. Responsible things. I did manage to get in like 4 episodes of Fixer Upper in the background. That was a bonus. as well as a few episodes of Tiny Houses... which always blows my mind. How are people going to live in 97 square feet? Harvey Dent alone takes up 97 square feet! Amazing. But then I got to spend my Saturday night the best way possible. With my 7th grade girls small group. Our church really likes for us to do things outside of church on our own - things that make those deeper connections. 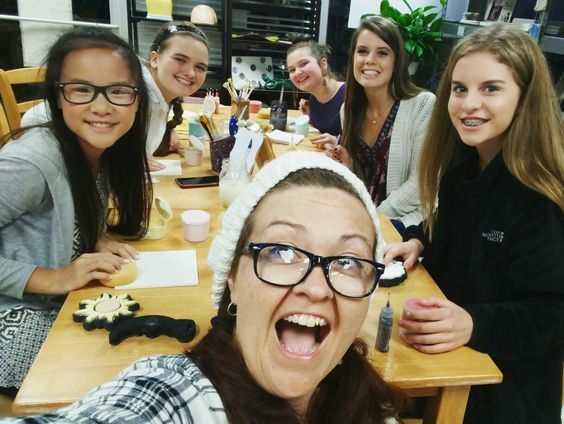 So I had mentioned going to paint pottery & the girls came up with an idea to meet earlier & eat dinner together, which I loved. Especially because it was at a place I had never been before. & in the end, I got a dinner I've never had before. Potato Enchiladas. Have you ever even heard of that? I hadn't... it wasn't bad though. Just what you would imagine though. Tasted like a big fried potato with enchilada sauce on it. The girls had told me all about the queso there too so had to get an order of that. It was yummy. White cheese queso. Tasted more like a mozzarella or whatever white cheese they put on mexican food. Pretty good. ... ok, so between us, I may be an adult...a really old one because I got home & took a shower & called it an early night after a night with no sleep before. Harvey Dent didn't mind the early bed time. Sunday had us back at church with an amazing lesson on praying for God's Will to be done. Powerful stuff. & then off to MSM with my girls again. They were still laughing about things from the night before & we're trying to think of our own personal group name. Someone suggested "Happy Accidents" because painting the night before, every time someone messed up, they kept saying, There are no such things as accidents - they are all happy accidents" ... how cute is that? But I kinda like that name just because I like the idea that God brought us all together form different areas of life... not really an accident on His part. We're still seeing if anything else 'sticks' on us, but love that the girls are about making a name for our own group. Again, loving these connections. They are already planning on a Christmas gathering. They suggested doing gingerbread houses at my house. I'm just trying to figure out how to get that many girls in my house with candy flying everywhere without Harvey Dent trying to catch every falling sweet to the floor. Anyone have any fun ideas for a Christmas gathering???? Lay them on me. I left MSM to go to my JOY Sisters while Ricky ended up heading out with some friends to go see Dr. Strange. Yep.. you'll hear me once again say how much I love my JOY gatherings. A lot of our group couldnt make it but I always feel like sometimes, the smaller groups are just a good way to connect on a different level. Love these ladies. It all worked out great because right when we finished, Ricky had called & was done with the movie so we were able to meet up for dinner. I was so thankful for that since I didn't get to have dinner with him the night before & felt like I didnt get to see him a lot for the weekend. Time to get home & do more adult stuff like bill writing & getting my week planned out for another busy few days ahead. ... & counting down to THANKSGIVING! Ready to start bringing up the Christmas totes. ... which I felt like we JUST took back downstairs. Talk about BLINKING & time moving fast. Now, to find a good slow weekend to get all the decorations up. Is your local radio station playing Christmas music yet? Any fun Christmas gathering ideas for teen girls? Aww that Ricky is too clever..lol. I forgot about Starbucks deal this weekend. I actually went to Dunkin and got a vanilla chi and candy cane crunch donut which is so unlike me cus I don't really like donuts but I wanted to be festive and it was actually good! My mom & I split the holiday drink deal this weekend! (And she bought me a new fox tumbler from the 'bucks!!) I love that Ricky tricked the system. That's too clever! And I love your sweatshirt in that Friday picture! I think it's so special that you get to hang out with young Christian women and guide them and teach them/learn from them. I think that'd be a really awesome opportunity- both for them and you! haha, I love how he ordered his drink, at least he got what he wanted :) I don't drink coffee at all, so Mr. would have just gotten two drink and then been bouncing off the walls, hehe. I need to make my way to starbucks to kick off the holiday (YES I SAID HOLIDAY) season with a peppermint mocha! You are the COOLEST!!! That is so sweet and you look good in the color green, ha ha, the love of the cups gets me everytime, lol. What?! I didn't know about the Starbucks deal! Also, I can't watch Tiny Houses... I feel claustrophobic just watching it! The Starbucks deal made me sad, I was going to go, but I work 'til 5. So, that would mean taking the latest lunch break ever. But then I would have no one to share the special with, lest I heated up another drink later. So I just took it as a sign I wasn't meant to go. Hahaha too funny he ordered the peppermint mocha with no peppermint. I mean it is sill to keep it to a certain kind of drink anyways, right? Stinks they didn't have the red cups at yours yet. They are so pretty!!! 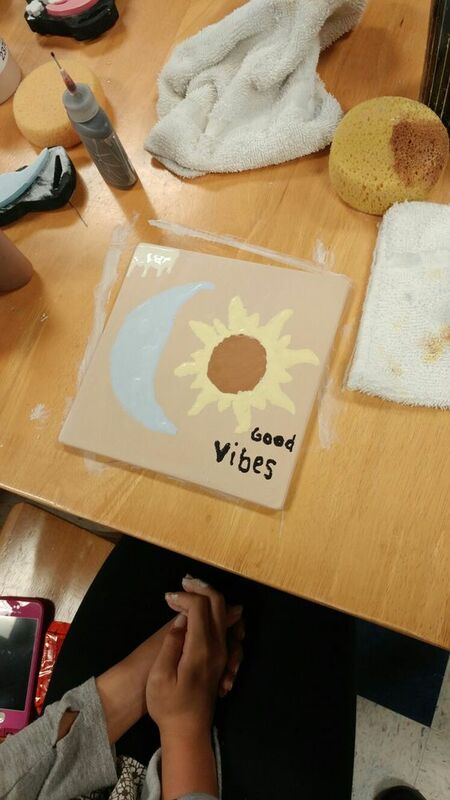 Sounds like you had a great time with the girls! 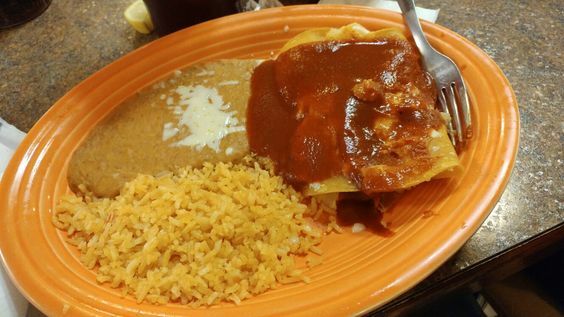 Enchiladas are my favorite order at Mexican but never had potato ones. Sounds fun! Hope you have a great week! Yep, we have a station playing all Christmas music and I love it! Never had a potato enchilada...I may have to check that out. Sounds like a great weekend! And I cannot believe that Thanksgiving is almost here. I keep checking my calendar because it feels impossible. Plus, it has been crazy hot in LA, like 90+ temps so it doesn't feel like Thanksgiving. I love all the work you do with your Church. It's awesome that you have such a great group of 7th grade girls to lead. I remember that age - it was so tough and I'm so glad they have each other and you. I love queso it's one of those things I crave weekly lol and my mexican place does potato burritos and tacos :) I love it all. That is great you are doing a teen night with the girls. You are so awesome -of course they want to hang with you ! I loved seeing the painting party on IG! It turned out so great. 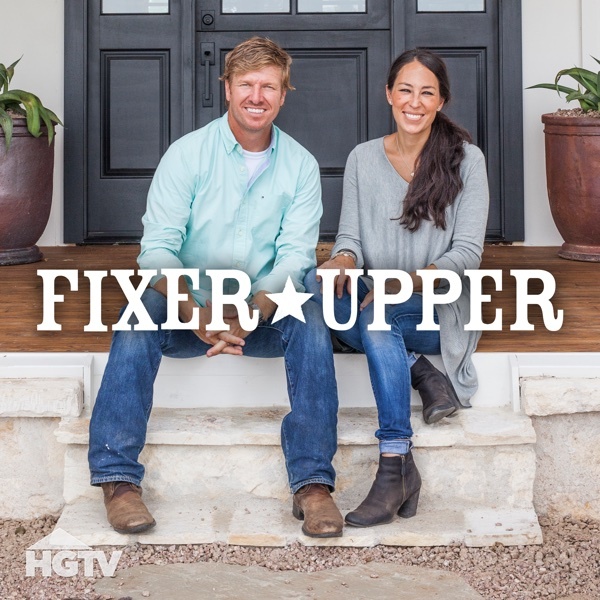 I have only seen fixer upper a few times, but it was just so good! hahaha I admire Ricky's style with his drink order. So glad you have your JOY group in your life. I have been listening to Christmas music since November 1st! I got no shame in my game. I went to Starbucks over the weekend too and they didn't have the red cups yet and I felt so dejected. That is so not normal!! I know it's only a cup but still!! haha Happy Monday! Christmas party idea...have you ever heard of My Favorite Things? Each person brings 3 of the same of their favorite things at a certain price point (for example, if I love Volcano Lava nail polish, I bring 3 bottles of it). They can be wrapped or unwrapped it doesn't matter. Then you print out each persons name 3 times, cut them out, fold them up and put them in a bowl. Then you pass around their names. So, if I pick out your name, then I would give you one of my "favorite things"...make sense? Every one leaves with a favorite thing of their friends. Best thing is, if you really like something and you don't get it, the cost is usually low enough where you could go out and get it for yourself! Sounds a little confusing, so let me know if I can clarify anything, but I think this would be so fun for you and your girls! I can also give you some ideas if you want...let me know! So much fun this weekend. I like the group name, Happy Accident and the thoughts behind it. I would have been sad not to get my red cup either. But it is pretty funny that the barista gave Ricky his drink even though it wasn't part of the deal. I wish there was Christmas music on the radio where I live right now, but no go. I guess I could do a Pandora station! LOL on your dog alone taking up all the square feet in a tiny house! I feel the same way. If I were single with no friends and no pets, I could live in a tiny house. I mean, they are so cute! Otherwise, no way! Love Fixer Upper too! And love the picture of you and the girls. A gingerbread house making party sounds awesome! Wow!! Rebecca Jo, I am tired just reading this!! My goodness! I sure do love your work with those young girls. What a great thing to do!! Well if they're not going to have a mocha on the menu what do they expect?! I'm hoping to go big with Christmas this year, but just when I've decided to give in to the madness it seems oddly hard to come by. So I'm stumped for ideas of what to do as well. Mine had the plain regular cups!! They didn't get them in until Sunday. So I went to a different Starbucks on Friday and then did the 2-4-1 on Sunday. Oops! This post just radiated happiness, and joy, and positivity, and enthusiasm. Thanks for that!